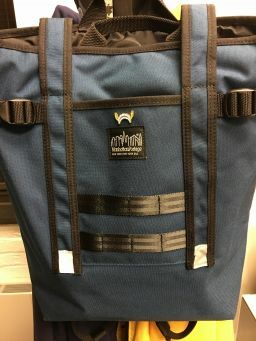 I recently purchased the MP Black Label Chrystie Backpack. The design of the bag is in the increasingly popular Japanese "tote ruck" style. That just means it is a hybrid bag that can be used as either a small backpack or a tote bag. Standout aspects of the bag include an integrated padded 13" laptop sleeve, a great internal organizer separated into several compartments, and a removable zip pouch which can be fastened to internal anchor points on either side of the bag. The interior compartment comes with a black lining. The outside of the bag has MOLLE military type fastening strips and 3M reflective patches. The backpack straps can feel awkward as they need to be undone every time you want to access the contents of the bag. I think this will be the biggest complaint for people, but most users will get used to it after a couple of days of regular use. Carrying capacity is approximately the size of the reusable shopping bags sold by most major super market chains. I haven't quite figured out a use for the external cinch straps yet. Overall, this is a nice daily commuter bag for those who prefer to travel light.